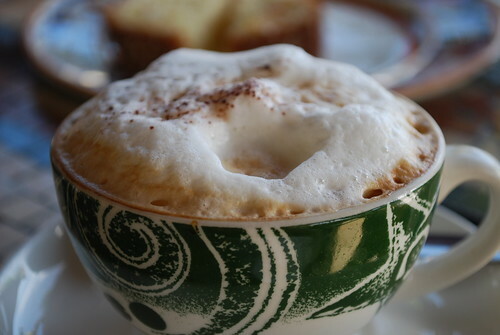 What is an Italian Latte ? First up, I must announce on my blog, for all those non-coffee geeks, who don’t know already, that the World Barista Champion is Mike Phillips of Intelligentsia Coffee. Intelligentsia Coffee is actually becoming world famous amongst the coffee world and so it won’t be that much of a surprise that they are able to churn out a world class barista. You can view more about Intelligentsia on my blog roll, or follow mike phillips on twitter on 1shotfortheroad – cool name. OK ! so as we’ve just been elongated with the technical terms of coffee at the WBC, I thought it apt to tackle the technicalities of the so called “what is an Italian Latte ?” debate. It’s actually a very contentious issue and on many forums, pages and pages have been written about what exactly is a latte. Let’s start from the basics. Caffe is Italian for coffee and Latte is Italian for… wait for it…. MILK. So strictly speaking, a caffe latte is coffee with milk. BUT, what sort of milk and what sort of coffee. Have a I lost you ? Stay with me. OK ! 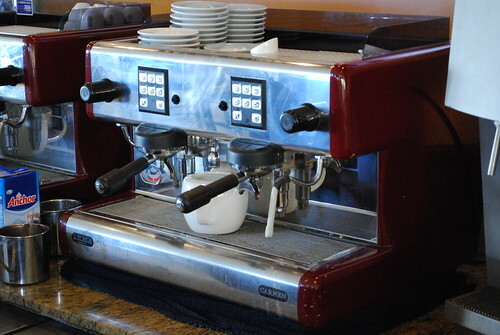 we know that most coffee drank in Italy, is espresso based, so that was easy wasn’t it ? We’ve got the coffee out of the way and now for the difficult bit, what sort of milk. We now have 3 types of milk, (i) heated milk, which you can just pour into a small pot and take of the heat when steam appears, or if you have a microwave, pop in for between 30-60 seconds, (ii) steamed milk, which ideally should display lots of steam when heated or if you are lucky enough to have a proper espresso machine, one in which you steam before it froths or if we are going to be technical place the steam wand right into the milk jug as far as it will go, and steam – it will heat up very quickly and you shouldn’t see any bubbles at all. (iii) frothed milk – what we all crave, because if done properly, it should be silky smooth and sweetish, with a wrap around your mouth texture – if you have never had this experience, then the barista that is making your drink, needs to be re-trained or you need to practice more, but this post isn’t about frothing milk, sorry ! So for Italian Latte, I have to be the bearer of bad news and commit myself to say, there should be no frothed milk, boo hoo ! The pic at the top of this post is one made using frothed milk and so it is an imposter. So, that’s right, what a great majority of cafes serve as a caffe latte isn’t a caffe latte, because it is covered with frothed milk. If you have time and money to waste, but are passionate about not getting conned, order a large cappuccino and a caffe latte at your “regular” coffee shop and try and tell what the difference is – good luck and let me know. OK ! Back to the milk stuff. 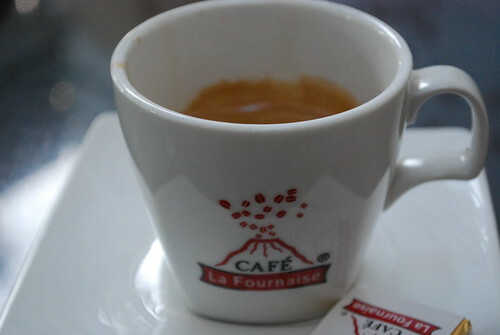 The first type of milk, heated, is what you should really have in the French version, cafe au lait – OK ! for those who don’t know French and coffee terms, coffee (using the French Press) with milk. 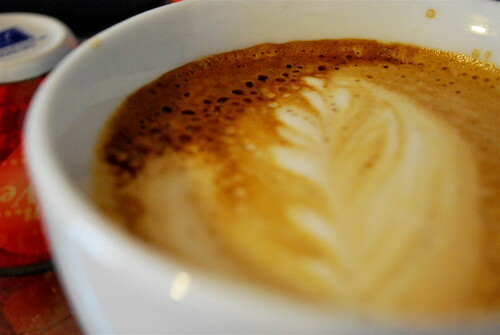 So, the second version, steamed milk, should ideally be used for the Italian caffe latte. How do you know if it is steamed and not heated ? Steamed milk should have a trickle of “body”. See below, that little white line on the top. If you are really passionate, after your drink, check out the inside. It should look a bit like this, Why ? Well ! 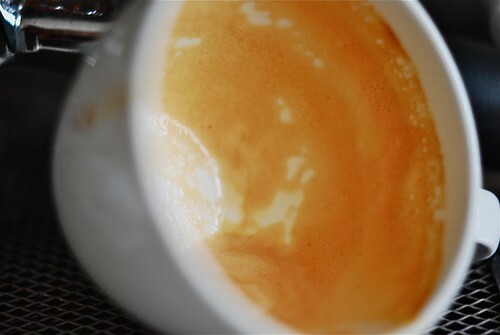 that bit of dark cream, is the crema from a well prepared espresso, a double in this case, which interacted with the steamed milk, giving it a bit of a “body” or thick skin. If there was frothed milk, it will still be there, thick as ever. 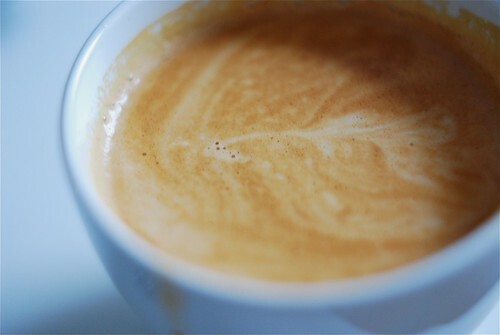 If it was just heated milk, it would wash away your crema and hence the evidence. I’m not mad, but just so you know, this is how the Italian measure their coffees afterwards, by looking inside after it has been drunk. All together now, mad coffee freak….. Hope you learned something, Take care and check those caffe lattes. 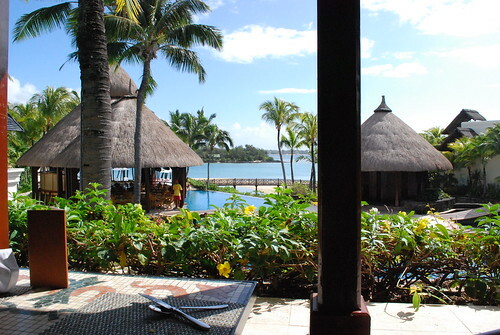 I was lucky enough to go on our family holiday this year to beautiful Mauritius. With the current financial crisis all over the “richer” part of the World, there are deals galore to dream destinations and Mauritius is definitely one of them. OK ! my second job is not a tour operation so I’m going to get to the bottom of the cup on this – what coffee experiences did I have, because you know that wherever I go I’ve got to have some sort of coffee experience. We stayed at this really nice hotel called Le Touessrok and all coffee served at this top hotel happens to be sourced from Illy. So every breakfast and every dinner I had Illy coffee. 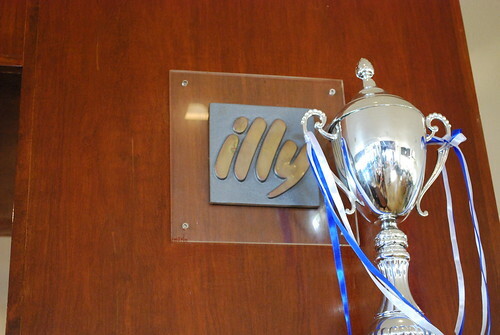 Now to be fair to Illy, sometimes it’s not about the coffee, it’s about how it’s served and sometimes it’s about the type of machine, which for a hotel that was voted the 7th best in the World, should be the best. However, to avoid libel (or being sued), I’m not going to comment on the machine below, as I don’t know what it is. From my current experience, lots of top hotels and restaurants boast about providing you with the best food, etc, but when it comes to coffee, there’s a bit of compromise. OK ! it was good to be asked what coffee you would like every morning. OK ! this is a bit exaggerated on the foam, but on another occasion the froth was a bit flatter. However with views like this from the breakfast table, you can forgive the barista. Not to be confined to the hotel, we did manage to explore a bit of the Island and headed up to the north-west of the Island to Grand Baie, where I managed to find Cafe La Fournaise on “Sunset Boulevard” named I guess because it is one of the best places to watch the sun set. The location of this cafe is right on sunset Boulevard and has a very French Riviera feel to it – you can easily think you are in a fancy European beach side resort. In any case I ordered an espresso, snapped away and gulped it down before our ride back to our hotel, some 1 hours drive away. Coffee was okay, but the location is a real people watching place, so I can imagine it being a popular place with rich locals and tourist alike. So, that’s my bit of sharing my coffee experiences in Mauritius, au revoir. Sometimes you think you know about coffee and then you try something and it just surprises you and you think “Let’s through that theory out”. 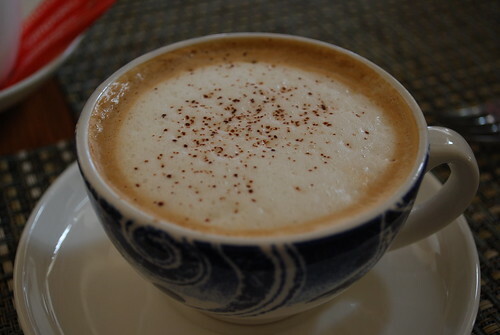 If you are a keen follower of my blog, you’ll have read my ranting and raving about Yemeni Mocha in my post of 3rd June 2009. Now usually when a coffee has what I call a really special taste that wraps around your mouth and has solid tones like Yemeni Mocha, Costa Rica El Portillo and many East African arabicas, extracting this coffee as an espresso I find makes you miss out on some of the really fine tones and tastes of the coffee. However, when extracted using a French Press, you really get to experience different tastes in your mouth and it really goes down well (your stomach). 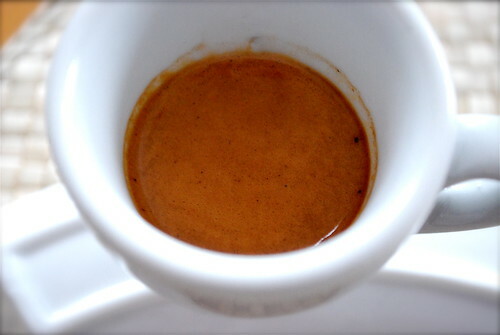 Now, just last week, I had run out of “espresso” coffee – Yes ! that’s right, there are some coffees that are better extracted as espresso than in using anything else (French Press, Filter, Moka, etc). I was now in a dilemma. 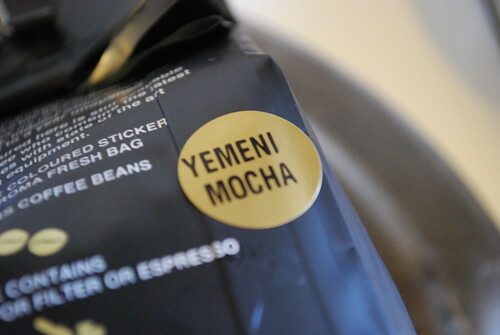 Should I just drink French Press coffee all weekend using my Yemeni Mocha, or should I try it as an espresso. 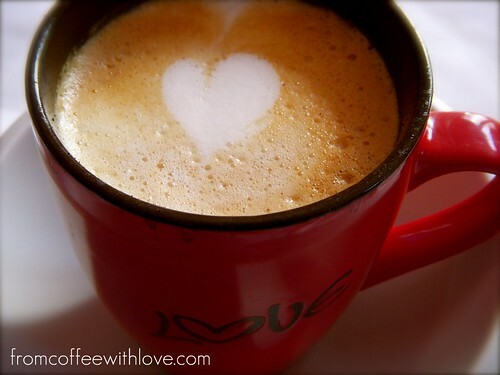 With nothing to loose, I used my precious Yemeni Mocha for espresso and….. Wow ! What an experience. Just look at that colour and yes it does tastes like it looks, dark, mysterious, smooth and delicious. The common characteristic of this bean is definitely chocolate – and it isn’t lost when drinking it as an espresso. It’s like dark chocolate and the colour is amazing. Perfect for latte art as you can see below, as it displays different tones of brown as the coffee blends in with the milk. As a milk based espresso it tasted like…. come on, you can guess right ? Yep ! Milk chocolate. You don’t really need to add sugar to this drink and you can rest be assured that you won’t regret it. However, before you rush out and serve this in your cafe, there might be one reason you won’t find many places offering Yemeni Mocha as espresso based drinks – it’s relatively more expensive than other single estate or blends. Sure, roasters like Andronicas (where I ordered this coffee from) who have a cafe in Harrods – one of the most prestigious and expensive stores in London, can get clientele to pay about the equivalent of $5-$7 an espresso, but some people especially during these trying economic times might scream daylight robbery at you. So, my advice, spoil yourself and use your precious Yemeni Mocha for both types of coffee, espresso and filter, not forgetting that the same amount of coffee used to extract a double espresso will make two good cups of coffee if using a French Press.